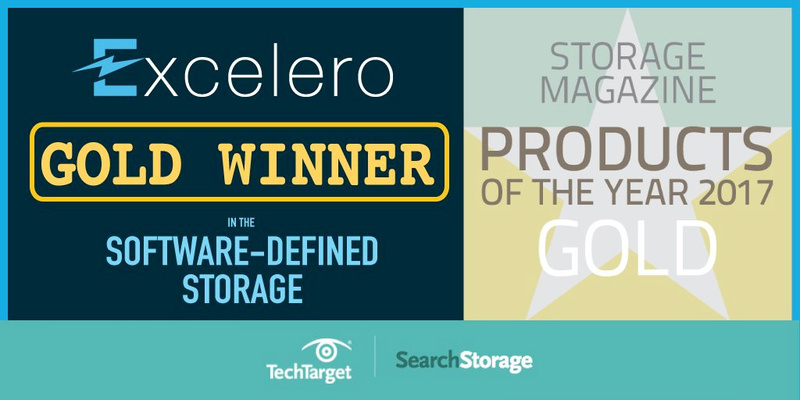 SAN JOSE, CA February 13, 2018 – Excelero, a disruptor in software-defined block storage, said that its NVMesh® 1.1 server SAN was named as the Software-Defined Storage Product of the Year by the 2017 Products of the Year awards from Storage Magazine and SearchStorage. In winning the Gold medal in the software-defined storage category, NVMesh topped 10 other solutions selected as finalists and was cited the judges as a “great way for an organization to easily exploit NVMe.” Judges ranked NVMesh as #1 for innovation and #2 for value. One judge cited Excelero’s patented Remote Direct Drive Access (RDDA) functionality as a key performance differentiator compared with products from other vendors of rack-scale flash technology. RDDA is designed to disaggregate storage from application servers and preserve CPU for applications. In its 16th year, the 2017 Products of the Year program evaluates innovation, performance, ease of integration into existing environments, ease of use/manageability, functionality, and value. Judges selected 14 Products of the Year in 2017 across five categories, from 47 finalists and 108 entries.